(MENAFN - Daily Outlook Afghanistan) HELSINKI – Finland's center-left Social Democratic Party is facing the tough task of trying to form a government coalition after becoming the Nordic country's largest party by an extremely narrow margin following Sunday's highly fragmented parliamentary election. 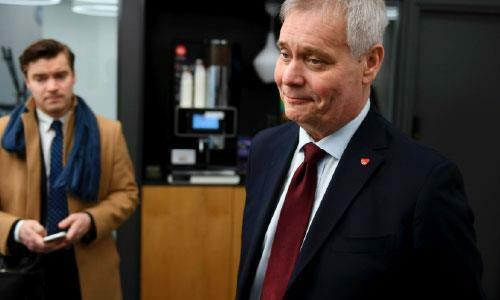 With all votes counted Monday, the party led by Antti Rinne took 17.7% of votes and 40 seats in the Eduskunta legislature, far from the 101 seats needed for a majority. Right behind came the populist Finns Party with 17.5%, while the conservative National Coalition party took the third spot with 17% of votes. Outgoing Prime Minister Juha Sipila's Center Party was fourth with 13.8 %.